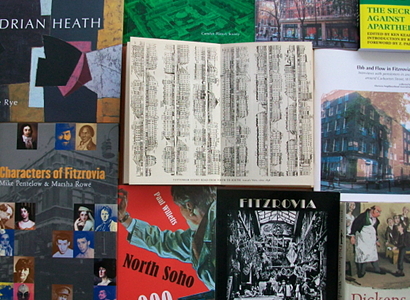 Part 2 of Fitzrovia Festival 2013 continues for two days only from 5pm to 9pm Wednesday 18 September (to coincide with London Design Festival late night in Fitzrovia); and 10am to 4pm on Saturday 21 September (an unofficial part of Open House London 2013 in Fitzrovia). Exhibition and book sale: 5pm to 9pm, Wednesday 18 September; and 10am to 4pm, Saturday 21 September. Venue: Fitzrovia Neighbourhood Association, 39 Tottenham Street, London W1T 4RX. Admission: Free. Not only are Fitzrovia’s streets and buildings of great architectural and historic interest, but in many of them lived people who shaped the world of art and politics. Come and find out more about this inner London district at this small exhibition where you can browse or buy books about Fitzrovia by local authors and many others. From E Beresford Chancellor’s London’s Old Latin Quarter published in 1930 containing John Tallis’ drawings of Tottenham Court Road and Goodge Street; Nick Bailey’s Fitzrovia street-by-street history of the Camden part of Fitzrovia published in 1981; to London Recruits: The Secret War Against Apartheid published in 2012. And there’s Charles Dickens, John Constable, and the ordinary residents who tell their own stories of life in this inner city neighbourhood. You’ll find lots to discover about the buildings and streets in this small library and bookstall. 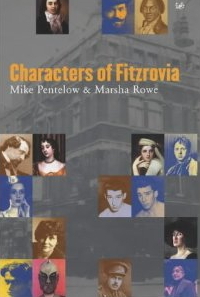 Update: We have a limited number of hardback copies of Characters of Fitzrovia by Mike Pentelow and Marsha Rowe (published 2001, 262 pages) priced £25. These are very rare brand new hardback editions that we have specially acquired. They will be for sale during the exhibition only. This entry was posted in Culture and tagged books, Fitzrovia, Fitzrovia Festival, London. Open House London, Open House Fitzrovia. Bookmark the permalink.